We have a few copies of 'Elements' left and are selling these with the new Bouldering in Scotland Guide for £30, so if anyone wants to take advantage, please look at the Films page on the main site, otherwise the offer drops end of April. When you publish a guide, there is usually a rash of sudden activity and development, which is great and the point of getting excited about bouldering in the first place. 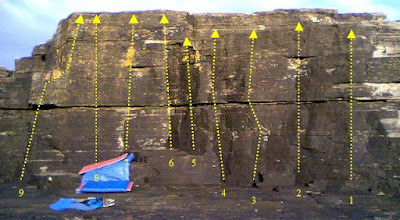 Magnus Johnson has found some new bouldering near Kinlochleven, mentioning 'one roof which is simply huge! Think the inside of the Shelterstone but with no surrounding blocks...' which all sounds interesting! Hopefully we'll see some problems there soon. For the adventurous, it's at NN149609, most of the boulders are mossy, but there may be some potential. I had a skirt of the North East for the guide but found little of interest, but we obviously missed the bouldering at Forss, near Thurso, courtesy of Raymond Wallace... I'm only sorry I couldn't have put it in the guide, we just didn't hear about it until we published! Raymond has done a nice online topo.